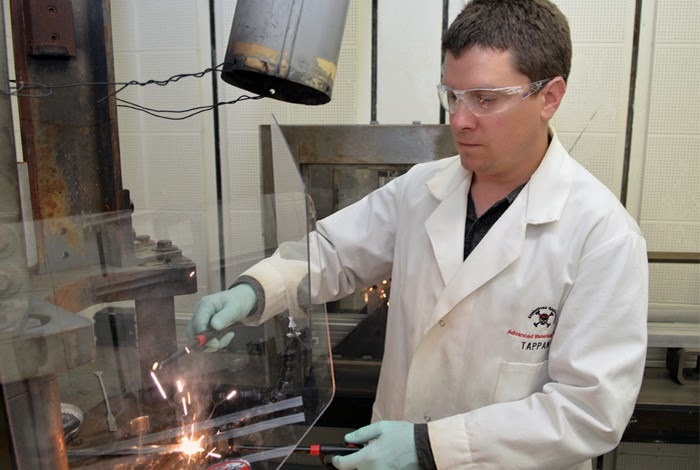 Los Alamos National Laboratory chemist Bryce Tappan ignites a small quantity of aluminum nanoparticle water mixture. In open air, the compound burns like a Fourth of July sparkler. Don't worry, that beer can you’re holding is not going to spontaneously burst into flames, but under the right circumstances aluminum does catch fire, and the exact mechanism that governs how, has long been a mystery. Now, new research by Los Alamos National Laboratory explosives scientist Bryce Tappan, published as the cover story in the prestigious German journal of chemistry Angewandte Chemie, for the first time confirms that chemical kinetics the speed of a chemical reaction is a primary function in determining nanoaluminum combustion burn rates. "It's been long understood that nanoscale aluminum particles, 110 nanometers and smaller, are highly reactive. Aluminum particles at this scale have been used in novel explosives, propellants, and pyrotechnic formulations," said Tappan. "The understanding of the combustion mechanism impacts how we look at the design of ever smaller aluminum particles like molecular aluminum clusters as well as possible nanoaluminum applications like hydrogen fuel storage devices and this might be a little 'out there' but also energetic formulations that could use extraterrestrial water as the oxidizer in rocket fuel." Tappan and his co-authors, Matthew Dirmyer of Los Alamos, and Grant Risha of Penn State University, made this discovery by looking for the "kinetic isotope effect" in nanoaluminum particles 110, 80, and 38 nanometers in size. The particles consisted of a "core-shell" structure with an elemental aluminum core and a two to five nanometer oxide shell. The particles are mixed with deionized water, H2O, or deuterium, D2O, to the gooey consistency of cake batter. The kinetic isotope effect is observed in a chemical reaction when an atom of one of the reactants (water) is substituted with its isotope (deuterium, or "heavy water") and the two reactions are compared for differences. This effect is considered one of the most important tools in determining chemical reaction mechanisms. For many years it’s been proposed that other mechanisms like oxygen diffusion through the particles, or tiny aluminum “explosions” in the mixture might govern the rates of the burning process. “Now we know that reaction kinetics are a major player,” said Tappan. "Knowing much more about the mechanisms at work in metal combustion gives you a chance to refine the models that govern these reactions," Tappan added. "This fundamental knowledge gives us a window on how to better control these processes." The research was funded by the Laboratory Directed Research and Development program at Los Alamos National Laboratory, with additional funding from the Defense Threat Reduction Agency.